THE richest prize in Irish jumps racing always attracts a stellar cast and this year is no different as 20 go to post – nine of which are owned by JP McManus – for today's €300,000 Galway Hurdle. Joseph O'Brien, Barry Geraghty and McManus teamed up to take the Festival showpiece at Ballybrit last year with Tigris River – which bids to become the first back-to-back winner since Pinch Hitter in 1982/'83 – but the Meath jockey switches to stablemate Le Richebourg in another intriguing renewal. A trio of English raiders will also hope to take the lucrative pot across the Irish Sea, but the spoils may go the way of Cork veteran trainer John Joe Walsh, who has primed previous Festival winner Davids Charm to land the odds in the hands of Rachael Blackmore. Only one favourite has done the business in the last 10 runnings and the nature of a beginners' chase makes it a tough start to the day as little is known about their ability over fences. Local trainers Steve Mahon and Pat Kelly go in chase of success, but this is likely to go to one of the bigger hitters and O'Brien's Aeglos fits the bill coming back from a break since last November. With some decent form over hurdles in the book, the six-year-old usually runs well fresh and is expected to make a successful chasing debut in the hands of Mark Walsh. Henry de Bromhead's Schmidt went down to stablemate Classic Theatre (which subsequently went on to take a novice chase) on debut at Limerick last month and is definitely one for the shortlist. Minella Beau won at this meeting 12 months ago over hurdles and is respected on his chasing debut for Willie Mullins, while Karl Thornton's Round Tower seems to be getting the hang of things over the larger obstacles and is one to keep an eye on. VERDICT: Aeglos can start his chasing career in good style. In just the third running of this race, there's very little to go on statistically, so it may be a case of picking the right Mullins horse. That's no easy task, however, as the Closutton maestro has serious strength in depth. Having lifted the prize last year with Rathvinden, he saddles four of the nine runners in the €50,000 contest and Robin Des Foret is a Listed winner over the smaller obstacles. He has done very little wrong in his chasing career with two wins from four starts while Paul Townend's mount came home lame when a beaten favourite at Killarney two weeks ago. After scoring at Wexford and Newton Abbot, Ornua bids for the hat-trick for De Bromhead and Dylan Robinson but this is a decent step up in grade and Mullins's Cadmium looks a step ahead of the rest. A winner of three of his five chase starts including his last two runs – a novice chase at Roscommon where he comfortably disposed of the re-opposing Le Martalin and a competitive handicap at the Punchestown Festival – he is the class horse in the field with Ruby Walsh in the plate. VERDICT: The top-rated Cadmium (nap) is banker material. It would be an extraordinary feat if Castlegar trainer Iggy Madden could produce 12-year-old Cairdiuil to prevail at his home track on his 17th appearance at Ballybrit. It looks beyond the realms of possibility, however, as despite boasting Festival form figures of 2-2-2-1-3-2-8-2-2-2, he races 19lb out of the handicap and it would be a minor miracle if he came home in front under Killian Leonard. With no fewer than five course and distance winners among the 14 runners, there are plenty in contention with Tom Hogan's Honor Oak, second here on Tuesday, a danger while last year's winner Remarkable Lady shouldn't be discounted off just 1lb higher than 12 months ago for Harry Rogers and Seán Davis, who claims a valuable 7lb once again. Ger Lyons's top-weight Tony The Gent is the preference, however, given his favourable draw and the 2016 Festival winner can be rewarded for a string of consistent displays with victory today. VERDICT: Tony The Gent can finally get his head in front. There have been six different victors since this €60,000 contest was introduced in 2012 and Dermot Weld can land his second and leave a frustrating few days behind him through the classy filly Yulong Gold Fairy. The only one of the 11 runners with course-winning form, having taken her maiden here 12 months ago, she is preferred to stablemate Sorelle Delle Rose having kept good company in recent months. Second in the 1,000 Guineas Trial at Leopardstown in April, she was far from disgraced when last seen in fifth behind the brilliant Alpha Centauri in the Irish 1,000 Guineas in May and is rated 3lb superior to her nearest rival. English raider Time To Exceed will have to improve by at least a stone to worry the judge but Henry Candy's decision to send the mare over is respected, while Aidan O'Brien's I Can Fly is the most likely to put it up to Weld. VERDICT: Dermot Weld holds all the aces with Yulong Gold Fairy. Willie Mullins has won three of the last nine runnings and again dominates the field with a quartet of contenders as Exchange Rate and Ruby Walsh bid to make amends for a fall at the first on Tuesday as the Kildare pilot was welcomed back from injury with a bang. Top-weight Causey Arch is well respected for Mullins and Townend having scored in back-to-back novice hurdles at Sligo and Roscommon while the crack team of Gordon Elliott and Davy Russell should make the frame with the smart Boot Camp. Pat Fahy won this race 12 months ago and is represented by Awayinthewest, but having only recently gotten off the mark over hurdles at the 12th attempt, others are of more interest. This is a totally different proposition to the quality of opposition which Exchange Rate was set to duel with earlier in the week and anything other than a win for the course victor would be a surprise. VERDICT: Exchange Rate is afforded the chance to bounce back. The big race of the day is as competitive as ever but John Joe Walsh looks to have laid out Davids Charm for an assault on the Galway Hurdle and he ticks a lot of boxes as he looks to bag his first winner of the season against the game's big hitters. The seven-year-old won a handicap hurdle at last year's meeting and has the assistance of Rachael Blackmore – currently leading the Irish jumps jockeys' standings – but has stuck to the Flat since taking a valuable handicap hurdle at Fairyhouse in December and looks an ideal candidate to land the spoils. Le Richebourg won a maiden here convincingly last year and commands respect for Joseph O'Brien and Barry Geraghty, but has struggled in the intervening period, while Mullins has several chances with the reliable Good Thyne Tara scoring at Ballinrobe and Cork to highlight each-way claims. Another Mullins runner Whiskey Sour won two valuable Flat handicaps at the meeting last year and was the fortuitous winner of a Grade One over hurdles at Leopardstown's Christmas Festival when left in the clear at the last. 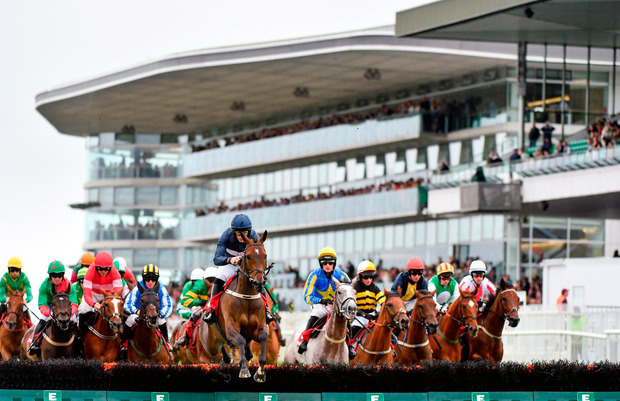 He is respected while stable companion Max Dynamite – twice placed in the Melbourne Cup – was second in this race three years ago, but has been frustrating to follow over hurdles and despite having the assistance of Ruby Walsh, he's likely to find a handful too good. An English attack sees Dr Richard Newland saddling Ludlow winner Leoncavallo and Iain Jardine sending over Bedrock but their best chance of victory may be John Quinn Project Bluebook, which was sixth in this race last year. VERDICT: Davids Charm can prove lucky for punters. Sonnetist makes the trip from England for trainer David Evans and has the assistance of red-hot jockey Gary Carroll but having only made the frame four times in his 19 career runs, he's hardly the most reliable selection in an 18-runner minefield. Surprisingly, five of the last seven favourites have obliged in a tricky affair and Dasmyhoss is an interesting runner for Robbie McNamara after coming up second best in two of his last three runs. Elliott has proved himself equally adept to winning on the Flat as well as in the jumps sphere in recent seasons and with High Expectations placed in his only run at the track last September, Declan McDonogh's mount may juts live up to his name. VERDICT: Elliott and McDonogh can collect with High Expectations. Six of the 16 runners are unraced so finding the winner of ‘the lucky last' can be a bit of a lottery, although Mullins and his son Patrick are usually the pair to keep on the right side of in bumpers. has no problem readying one to win these type of contests so Punchestown third Doctor Duffy is worth a market check. Luke Comer's Russian Soldier has been third three times in a row at bumper level and is unlikely to make the step up to prevail, while Gearóid O'Loughlin's Whatsyourstatus may step up sufficiently from his Roscommon fourth to make the frame again. A very speculative punt is taken on John Neilan's newcomer Mossroe in the hands of the very capable Declan Queally as the local trainer was a shock 50/1 winner of this race two years ago with Poormans Hill and may do something similar again. VERDICT: Mossroe could be value to sneak into a place at a big price.